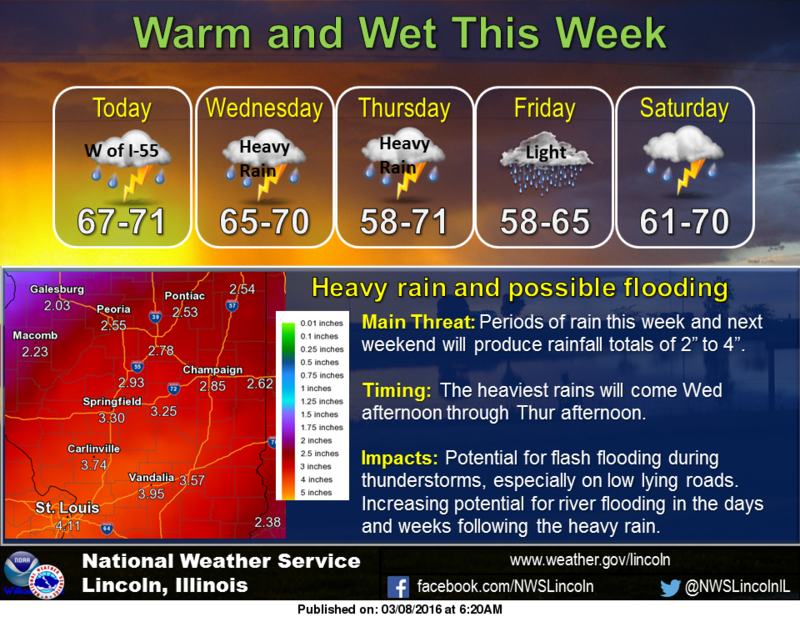 Central Illinois could receive an abundance of rain on Wednesday and Thursday as two to four inches is possible across the region. Chris Miller, National Warning Coordination Meteorologist at the National Weather Service in Lincoln told Regional Radio News a frontal system will stall in the region, resulting in a few inches of rain. The accumulating rainfall could cause low lying roads and areas to become flooded, along with water overflowing out of creeks and streams. Area rivers may become flooded following the rain. Any storms that occur will produce heavy rain, while the severe wind and hail potential is low. Miller says the rainfall this week will not match the magnitude of last year’s major flooding in December. Another quarter of an inch to an inch of rain on Friday night through Sunday night is possible. Miller says those who see a roadway that is covered with water to turn around. More information can be found at weather.gov/lincoln.